My faith is strong because of Winnifred. I will miss our occasional conversations about life and faith. She has helped make me the man I am today. I am forever grateful to her. I wish I could be there for her family as they celebrate her beautiful life. God is very proud of her and all she has done in life for him. I pray for her family and that they realize how many people she touched and made better. Winnifred, you will be missed. I will love you forever. 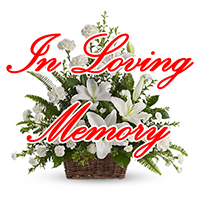 Bernadette & Family, We wish to extend our heartfelt sympathy on the loss of your mother. From the moment we met Mrs. Winnifred, she touched our hearts. We hope you find strength in the love of family and in the embrace of friends. With deepest sympathy.